Increase hightly performance of Dualband Baofeng or wideband scanner, with the antenna Diamond SRJ77CA for 2m/70cm (144/430mhz), 39cm long, and receiving from 120 to 900 MHz. Work also for VHF marine band RX & TX from 150 to 162 MHz. With a SMA-J connector (SMA female). Suitable for all Baofeng handheld (UV-3R, UV-5R, UV-82) and all HT radio with SMA-P connector (SMA male). Comes with: Diamond Antenna SRJ77CA genuine warranty Diamond Japan. Equivalent model available at Nagoya in dual-band 144/430MHz: NA-771 and NA-24J. 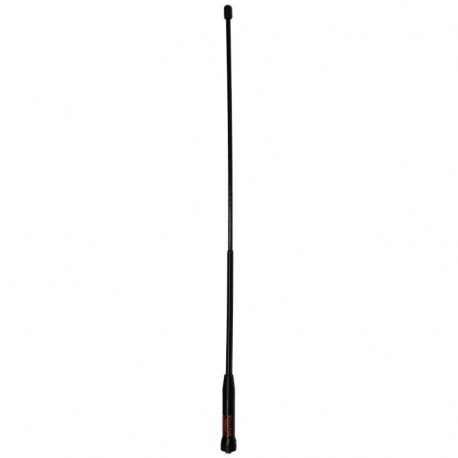 Description: Increase hightly performance of Dualband Baofeng or wideband scanner, with the antenna Diamond SRJ77CA for 2m/70cm (144/430mhz), 39cm long, and receiving from 120 to 900 MHz. Work also for VHF marine band RX & TX from 150 to 162 MHz. With a SMA-J connector (SMA female). Suitable for all Baofeng handheld ( UV-3R , UV-5R , UV-82 ) and all HT radio with SMA-P connector (SMA male). Comes with: Diamond Antenna SRJ77CA genuine warranty Diamond Japan. Equivalent model available at Nagoya in dual-band 144/430MHz: NA-771 and NA-24J .